Briar Rose is a fun and easy pattern that has been designed to work up to any size your little heart desires. This great little pattern works up super fast so it’s a definite go-to project when you need a pretty gift in a hurry. Briar Rose is a fun and easy pattern that has been designed to work up to any size your little heart desires. The pattern is worked using a simple set of repeats. You can use two 4ply Fairy Cake with a 3.75mm hook. You can purchase this pattern in my Ravelry Store. Once you have a Ravelry account any pattern you purchase will be stored in your own pattern library that you can access as you need. You can purchase this pattern here on my site. Once you have a HOS account any pattern you purchase will be stored in your own pattern library that you can access as you need. 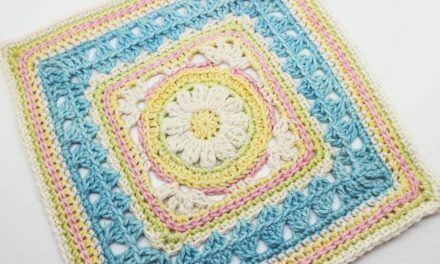 To make a one square meter Briar Rose, you need one yarn cake, if you need to go larger or your tension differs you will need two or more. We have an awesome team in our facebook group who offer pattern support. Join our group here and post questions you need assistance with and the HOS assist team will be there too help. Please note we do not have pattern support via email.